How do I send submissions to my Kindle? Move submission files from your Submittable account to your Kindle. In addition to enabling you to review submissions on your iPad and iPhone, the Submittable platform supports sending documents directly to your Kindle. To use this feature, you need to set up your Kindle email within Submittable, and set up your approved email list from within Amazon. Click on your name in the upper right-hand corner of your screen and select Settings. 2. In the Send-to-Kindle Email box, enter your Kindle email (e.g. myname@kindle.com or myname@free.kindle.com). 4. 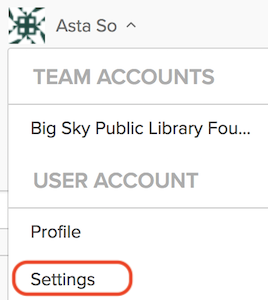 In the Content and Devices section of your Amazon account (under Digital content and devices), go to the Settings tab and scroll down to the Personal Document Settings section. Click this section to open it. 5. In the Approved Personal Document E-mail List, add the email address kindle@submittable.com. Emails to your Kindle will be sent from this address. 6. 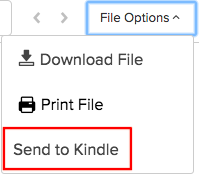 Now, whenever you're viewing a file from the Submission Details page, you can send it to your Kindle by selecting File Options > Send to My Kindle. Selecting this option will send the submission file to the Kindle email you registered above. See Amazon's Using Your Send-to-Kindle Email Address help article for more information. A list of supported file types for Kindle Personal Documents Service is available here.